Industrial Hygiene (IH) is the anticipation, recognition, evaluation, control and prevention of hazards from work that may result in injury, illness, or affect the well being of workers and the environment. These hazards or stressors are typically divided into the categories biological, chemical, physical, ergonomic and psychosocial. The risk of a health effect from a given stressor is a function of the hazard multiplied by the exposure to the individual or group. Environmental and industrial hygienists are considered experts in exposure science and exposure risk management. Depending on an individual’s type of job, a hygienist will apply their exposure science expertise for the protection of workers, consumers and/or communities. When it comes to industrial hygiene, EHQS uses strict and rigorous scientific methodology and professional judgment to determine the potential for hazardous exposure risks in workplace and the environment. 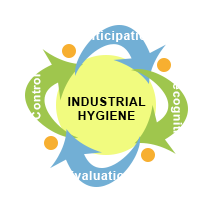 It is our goal as industrial hygienists to help prevent industrial disease, by using the science of risk management, exposure assessment and industrial safety. We seek to implement “safe” systems, procedures or methods and apply them in the workplace or to the environment. © Copyright 2018 EHQS Consulting, LLC. Copyright © 2019 EHQS Environmental Consulting. All Rights Reserved.